Cabo San Lucas is known throughout the globe as a premier destination for fishing. Why is this, you ask? Well, you can soon find out! Cabo San Lucas is located at the tip of the Baja Peninsula, right in between the Pacific Ocean and the Sea of Cortez. The waters surrounding the tip of this peninsula are some of the most active waters in the world. Just a mile off shore are the deep blue waters that are home to some of the best and most desired sportfishing species around! Whether it’s marlin, tuna, sailfish, grouper, mahi, or snapper that you are after (and that is just a short list of the species found here), Cabo is the best place for a wide variety of fishing. The RedRum is a 31-foot Bertram fishing boat that is perfect for groups of up to 5 guests. We work with a passionate and dedicated team of experienced Cabo San Lucas fishing captains. 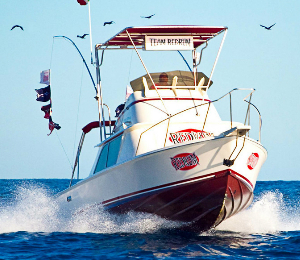 This team knows just what to do to provide you with the ideal Cabo fishing excursion. Whether you are a highly experienced angler yourself, or completely new to fishing, your guides will be on hand to help you in any way you need and to take you to the best locations for non-stop fishing. The RedRum private charter comes fully equipped with twin-engine inboard Cummins, a single fighting chair, and an on-board bathroom. The charter also comes with upscale fishing gear, a full lunch with sandwich and snacks, bait and tackle, bottled water, and a cooler full of ice. Can you gaurantee that we will catch fish? I have been to the Bahamas many times, but RedRum - 31' Bertram is one of my favorite trips! It includes everything that everyone should do here. As a Bahamas veteran, I can say only the best about this experience!